Cherish My Pets: Is Animal Testing Used in Your Dog Or Cat's Flea and Tick Product? Animal Testing - You may not realize it, but inhumane animal testing is most likely used in the registration process of your dog or cat's flea and tick control product. The U.S. Environmental Protection Agency (EPA) requires drug companies that manufacture and sell toxic chemical flea and tick pesticides to perform animal testing on helpless laboratory dogs and cats. The procedures involved will not only break your heart, but also send you searching for natural flea and tick treatments instead. One common test is called the Lethal Dose 50 Percent (L50). This procedure exposes animals to a particular chemical in order to determine the dose necessary to kill 50 percent of the test population. Between 60 and 100 animals are required, and testing spans a time period from two weeks to several years. Since animals refuse to swallow noxious chemicals, they are force-fed liquid chemicals by stomach tube or through a hole cut in the animal's throat. Other variations of animal testing include forcing the test subjects to breathe the chemical fumes, or applying the poison to the animal's shaved skin, or injecting the substance into the animal's abdomen. No painkillers are used as these substances may affect test results. No remedial treatment is given to injured animals. Those innocent creatures not fortunate enough to die from animal testing are eventually killed and used for autopsy, or recycled and used for additional testing. A few of the adverse health conditions suffered by animals given chemical flea and tick pesticides include uncontrolled whimpering, labored breathing, unsteady gait, convulsions, diarrhea, enlarged kidneys, thyroid cancer, and brain tumors. Clearly, these adverse health hazards occur with large doses applied over a short period of time. What is not so clear is why the big drug companies expect consumers to continue their testing by applying smaller doses to our beloved dogs and cats over a longer period of time. And why we do it. Simply stated, if the label on your flea and tick product carries an EPA Registration Number, it means that cruel, unthinkable and often unreliable animal testing was performed (including the L50 test) during the product's registration process. On the other hand, if the label states that the product qualifies for exemption from registration under the Federal Insecticide, Fungicide, and Rodenticide Act (FIFRA), this means the EPA has classified the product's active ingredients as "posing insignificant risk to humans, animals and the environment." Let your conscience and good judgment be your guide. 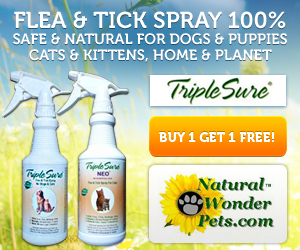 While I recommend TripleSure Natural Flea & Tick Spray for Dogs & Cats, please switch to any one of the many effective yet safe and natural remedies available today. Bad Dog Breath Can Be Serious!